More information: Some gigs are simply meant to be out there - even if they take decades to actually make it into our hands. This is without doubt one of those concerts; recorded at the Philips Halle, Dusselsdorf on the 28th March 1979 during the Live Herald Tour. Includes the only known live recording of 'Talking to the Sun'. 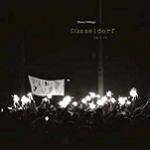 This new ‘Dusselsdorf’ double CD showcases the Steve Hillage Band’s prowess with excellent sound quality - a quality so high that you’ll forget that it’s a live recording until the applause. This is a band at the height of its powers, with Steve in great voice throughout, and most obviously utterly enjoying themselves. The vibe is completely infectious and doesn’t let up throughout the entire gig. Featuring Steve’s own adventurous compositions and covers of Beatles and Donovan classics, all are approached with a joie-de-vivre and high sensibility. The trademark heady combination of vibrant psychedelic rock interwoven with an irresistible full blooded groove, interspersed with the smoothest of deepspace synth/guitar trips gathers all before it in a tsunami of up-lifting music. With the benefit of hindsight, Steve’s musical trajectory from the creative space riffs of Gong to the trance and techno of System 7 is made instantly clear.